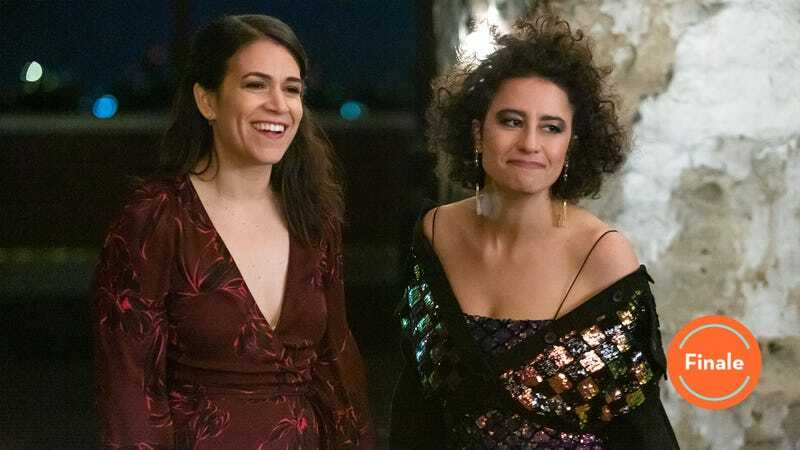 “This is still going to be the most beautiful, deep, real, cool, and hot, meaningful, important relationship of my life,” Ilana tells Abbi on the Brooklyn Bridge in Broad City’s absolutely gutting yet still hilarious series finale. Broad City turned in an ambitious final season, pushing its central friendship into new territory by blowing it all up. This final season has leaned on a lot of the show’s lasting strengths—the chemistry of these characters, the chaos of New York City—but it also feels distinct from the four seasons that precede it. All the promos for this final season teased a big dramatic ending with images like Abbi and Ilana hanging on for dear life off the side of a building. And in actuality, this ending is a big dramatic ending! It might not be literally explosive, but it sure is emotionally. Abbi and Ilana still went on their wacky little adventures, and they even attempt another one in the finale when they happen across a fancy toilet in lower Manhattan and become determined to wheel it across the Brooklyn Bridge. But in addition to going on their madcap quests, Abbi and Ilana have also had to grapple with the idea of no longer having each other this season, sparked by Abbi’s decision to move to Colorado for an artist residency. That stark, crushing reality has given a whole new pathos to this final season, a meta reflection on good things coming to an end. Goodbyes are hard, and Broad City makes that the literal focus of its farewell episode. “Ilana, I’m really scared. I’m moving across the country and changing my life,” Abbi says on the bridge and, later, “me and you, we’re still going to be us.” Abbi and Ilana have to say goodbye over and over, as often is the case when ending a meaningful relationship. Ilana runs away from Abbi on the bridge, saying she can’t go to dinner because saying goodbye again would just be too hard. In truth, she’s running home to set up for the surprise party that lets some of the show’s most important recurring characters say their goodbyes to Abbi, but those tears aren’t acting. There’s some truth in what Ilana’s saying. All the little rituals they’re going through, like securing one final bacon, egg, and cheese sandwich (which they fail to do, because Abbi and Ilana often fail at their missions, which is part of the fun), are tinged with deep sadness, with the knowledge that this is the last time they’ll do this thing in this way together. And then Abbi tries to slip out without saying goodbye in the morning, and Ilana freaks out. It’s easy to empathize with both of them. There’s no perfect way to say goodbye. Abbi felt too much pain at the thought of doing it all over again. “I mean, I don’t even feel like I was like alive before I met you. You like taught me, taught me how to do it,” Abbi tells Ilana on the street, the pale blue-gray early morning lighting both beautiful and sad. That kind of intensity and emotional potency is what makes Abbi and Ilana such a special friendship. You don’t see stuff like that on television a lot. Their friendship has always been complex and fully believable. It’s the kind of romantic friendship between women that feels often impossible to describe, and yet this show paints such a clear picture of it. Their friendship indeed has many times looked like a romantic relationship, even at times being a bit sexual, which ties into how this show has always felt very queer in its DNA even before it was explicitly so. This is not a typical friendship for television, and Broad City has rarely ever felt conventional, slightly anarchic in its approach to storytelling. Broad City knows it’s impossible to sum up a friendship with a simple description, so it spent five seasons just showing us what Abbi and Ilana’s relationship looks like over and over, creating something beautiful amid all the zany shenanigans. Lucia Aniello’s tight directing imparts intimacy in every shot. Abbi and Ilana looking out at the city skyline from the Brooklyn Bridge is particularly indelible. And the way the camera glides down to their Sharpied Abbi + Ilana Forever inscription on the bridge and then again to the post-it Abbi leaves on Ilana’s forehead when she leaves in the morning has a gentle fluidity to it that really captures the drama and emotion of this farewell. Again, that morning light during the last goodbye is just so perfect. And we also get a nice, close-up scene of just Abbi and Ilana in bed, Abbi filming Ilana go on social justice rants about random topics. It’s a nice, quiet moment, a more lowkey look at their friendship, and Aniello’s direction here reiterates the familiarity. Aniello also directed the pilot episode, and there’s a lot about this ending that feels very full circle. As usual, the city is a huge part of the story and visual landscape of the episode, a de facto third character that is as much alive and compelling as Abbi and Ilana. The Brooklyn Bridge scenes are lovely, and the rooftop setting of the final party is distinctly New York, too. Abbi is fooling herself if she thinks making herself a bacon, egg, and cheese in Boulder could ever compare to the real deal. 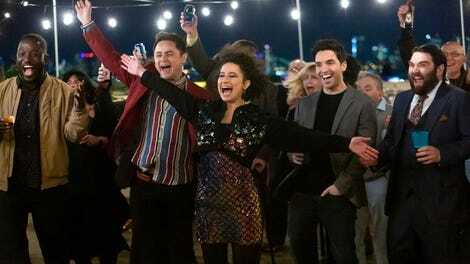 Sure, it’s not the end forever for Abbi and Ilana’s friendship, but it’s still an ending, a closing of an important and long chapter in their lives, just like this is no doubt the closing of an important and long chapter of Abbi Jacobson and Ilana Glazer’s actual lives outside of the show. The final scene reveals that they talk on the phone all the time, but it’s not the same. They have a new relationship now, and that’s okay, but it’s also okay to be really sad about it. Broad City lets Abbi and Ilana be sad and scared, just as this show has always tackled powerful, messy emotions head-on, letting Abbi and Ilana be really complicated, dynamic characters who never seem to fit too neatly into a box, especially when together. From its inception, despite its incredibly simple premise, Broad City always felt fresh, exciting, even at times revolutionary. Its slapstick voice and style was established immediately, painting a colorful, queer, sometimes surreal universe. Plop Abbi and Ilana into any scenario—from locking themselves out of their apartment to a rooftop party to a co-op grocery store—and funny, weird, shenanigans would ensue. But despite how over-the-top and often dreamlike their world and adventures are, Abbi and Ilana have always been strikingly real, two women who don’t conform to expectations. They’re smart, charming, flawed. The ending reiterates that Broad City was always just a show about best friendship. There are countless Abbis and Ilanas out there—inseparable duos who love each other and go on adventures together. Abbi and Ilana are two very specific individuals whose ins and outs we have become intimately familiar with over the course of these five seasons, but their relationship translates to something more universal. It’s a bright ending, one that gets to the heart of the show and what it represents. There’s no perfect way to say goodbye, and yet, Broad City did it perfectly. I’m going to get a bit sentimental here, because covering a series finale always feels like a special thing, so bear with me, folks! I knew I was going to be sad about the ending of this beautiful series, but I had no idea how emotional I would truly be until watching the finale in a room packed with fans in New York this week. This show has been incredibly important to me as both a fan and a critic. I first wrote about it for my college newspaper when I was 21-years-old. For the first two seasons, my best friend Caroline Framke covered the show here at The A.V. Club, and I had the true pleasure of taking over when she left. Around the same time I started writing these reviews during season three, I also moved to Brooklyn, and my relationship with the show evolved. It’s always special when a show can end on its own terms. This whole final season has been a masterclass in how to write a final chapter for a comedy series. Everyone involved should be incredibly proud. I was always going to have an emotional reaction to the show ending, but they really took things to the next level with all this realness! I cried more during this final season than I do during most seasons of television! THEY DID THAT! If you don’t follow Abbi on Instagram, you should go check out her most recent posts, which have all been throwbacks from throughout the show’s run. Abbi leaving Ilana with the dress is another example of how much meaning has been infused into various props and clothing on this show. For us, there’s genuine sentimental value to that dress!